IT organizations have been evolving their WAN connectivity strategies to align with new IT cost, resilience, and performance objectives. Hybrid WAN is a growing trend with many organizations and enterprises, enabling them to augment traditional private leased lines or MPLS-based WAN circuits with secured public Internet services to achieve their goals. 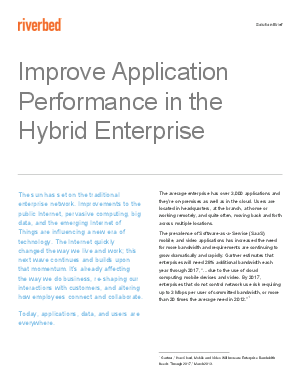 Riverbed takes a holistic, application-centric approach to solving the challenges of hybrid architectures. Read how SteelHead's hybrid architecture simplifies the laborious aspect of operating in a hybrid WAN environment.